A new system has been launched which aims to provide a fair and transparent process for obtaining leadership roles for main operations. Modpack, The Reach Wiki, Updated rules and procedures & A new Tuesday series! It's been a busy month for updates at Reach and as you can see with the title, we're landing multiple changes all at once. Stick with me here, we have a lot to go over but I'll keep it as brief as possible. The modpack update is on the brink of release and with it come a few dramatic changes to the arsenal at Reach. A full changelog will cover the details but as a brief overview we say goodbye to the HLC weapons as well as a few other staples like the HK417 and MG4 & 5 in favour of adding the whole RHS Escalation USAF pack. After extensive testing on the Thursday Immersion nights it became apparent the pack offers something for every role at Reach. Including the pack also means less fiddling with multiple separate packs for our modding team, which as I'm sure you'll all appreciate will take a lot of the workload off the guys. We can also expect the full compliment of vehicles, there are multiple HMMWVs, MRAPs, trucks, armoured vehicles and air (say hello to the Apache finally as our primary close air support attack chopper!). Obviously a new pack warrants an asset acclimatisation and there will be plenty of time to trial all the new weapons and vehicles next week at our Tuesday training session. Our community is full of knowledgeable members who share information and skills with all of us on a daily basis; what better way to present all this information than our very own wiki. The staff team have made headway putting up the first bits of information but we have a long way to go yet. If you have information you'd like to see on the wiki please get in touch with a member of staff and in the meantime take a look at the pages that are currently live. We will be transferring as many of the guides as possible and will continue to populate the wiki into the future. You'll notice we have guides for respawning, weapon restrictions by role and other useful information, some of which I will elaborate on below. We haven't updated our rules page since September 2013 and as the community evolves and new members join, it felt we were a little overdue an update. 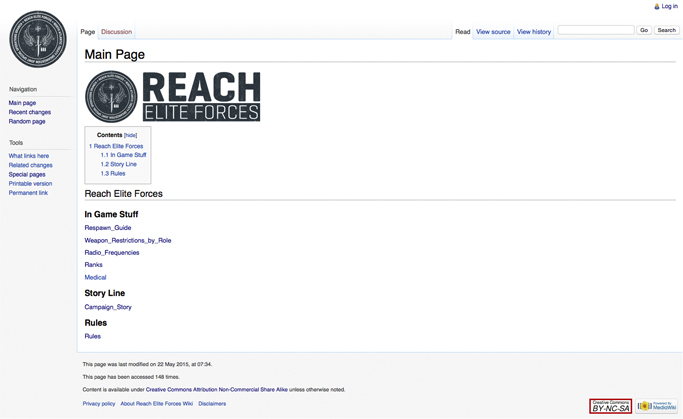 The Rules page of the wiki, available via the following link, wiki.reacheliteforces.com/w/Rules covers some of the very basic aspects of being a member of our community. It's come to our attention over the months that it can be fairly confusing when you respawn regarding what exactly you should do in order to get back to your team. This information is now on the wiki and covers the various steps you can attempt to regroup with your section. In order to keep the roles unique and ensure that you are carrying the correct weapon for the job we have taken the opportunity with the new Modpack update to create some restrictions by role of what weapon you can take into the field. For most of you this will either be obvious or irrelevant as you already carry the correct weapon; for others who like to bend these rules? Well, section leads now have a handy guide to point you towards if they need to enforce a rule. Please take the time to view what weapons your selected role may carry and if you have any questions, don't hesitate to get in touch with your NCO or an officer. Along with the platoons new names that heralded a new structure for Reach (and one which we're all slowly starting to get used to) it's time to retire the Overlord callsign previously used for Platoon HQ and adopt a new one for Company HQ officially. The new callsign, 'Guardian' started as a suggestion on the immersion series and will be replacing the callsign Overlord for Company HQ on the Tuesday sessions as well, starting from the Tuesday training session on the 26th May. And finally, on behalf of all of us, I'd like to thank Lunatic for his four part series set in the Takistan mountains. There were a many firsts for Reach on this campaign as we were presented with a dynamic and evolving scenario which swiftly began to spiral out of control and ending on an epic cliffhanger. Will we see a return in the future? From the debriefs it was clear some lasting memories have been etched (scarred?) into our brains. It was pleasure to see how the series developed and how the weight of decisions impacted things further down the line. Thank you Lunatic! If you have any questions on any of the above, don't hesitate to pop one of the officers a pm on the forums, grab us on steam, or even on teamspeak.